Metal spraying is spraying hot metal on to a surface to create a coating. Thermal spraying techniques are coating processes in which melted (or heated) materials are sprayed onto a surface. The “feedstock” (coating precursor) is heated by electrical (plasma or arc) or chemical means (combustion flame). Thermal spraying can provide thick coatings (approx. thickness range is 20 micrometers to several mm, depending on the process and feedstock), over a large area at high deposition rate as compared to other coating processes such as electroplating, physical and chemical vapor deposition. Coating materials available for thermal spraying include metals, alloys, ceramics, plastics and composites. They are fed in powder or wire form, heated to a molten or semimolten state and accelerated towards substrates in the form of micrometer-size particles. Combustion or electrical arc discharge is usually used as the source of energy for thermal spraying. 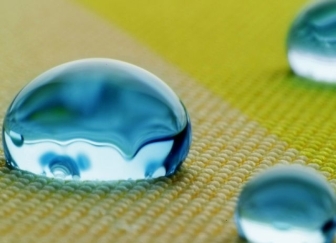 Resulting coatings are made by the accumulation of numerous sprayed particles. 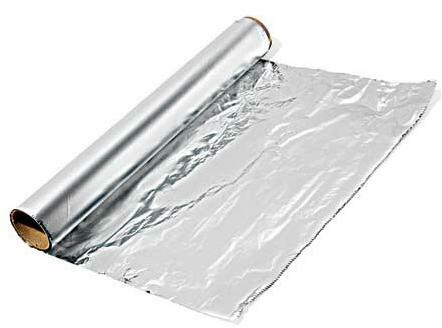 The surface may not heat up significantly, allowing the coating of flammable substances. Surface adhesion is purely mechanical and as such, a solid key is required, free of grease or other contaminants. Therefore the careful cleaning and pre-treatment of the surface to be coated is extremely important. Surface roughening usually takes place via grit blasting with dry corundum. In addition, other media, such as chilled iron, steel grit or SiC are used for some applications. All items are grit blasted with sharp abrasive grit to achieve a surface roughness of approximately 100-300µin. Besides the type of grit, other important factors include particle size, particle shape, blast angle, pressure and purity of the grit media.Suitable substrate materials are those that can withstand blasting procedures to roughen the surface, generally having a surface hardness of about 55 Rockwell C or lower. 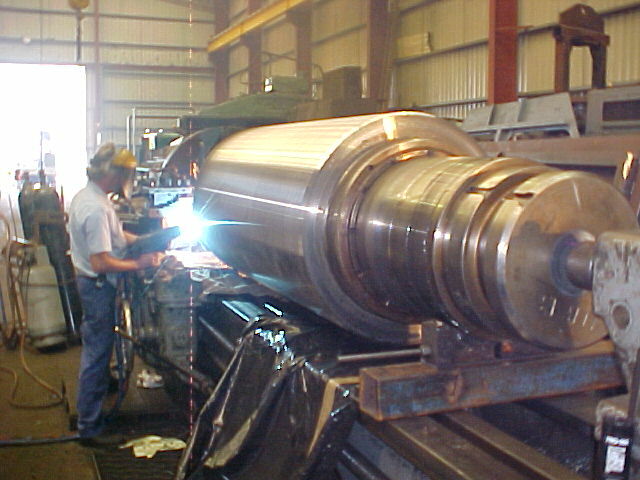 Special processing techniques are required to prepare substrates with a higher hardness. provide protection against corrosive atmospheric environments. Aluminium silicon coatings are used for repair and restoration of aluminium based substrates and for low temperature seal applications in compressors. The addition of silicon in the aluminium alloy provides improved machining capability over coatings of pure aluminium. produce a dense wear resistant coating, which is especially good for mis-machined components, repairs, restoration or to provide a bearing surface on a different substrate. 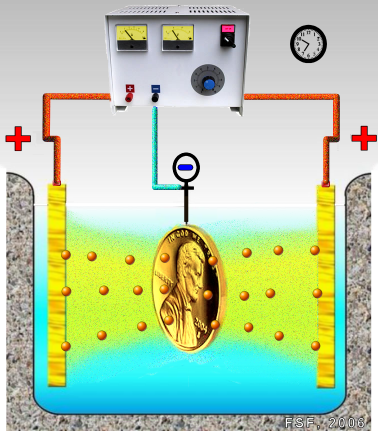 provide good conductivity for electrical applications. Copper alloy coatings are used for machine element work, salvage, repair and restoration of copper based substrates. appropriate for general-purpose wear applications are available. The various grades with differing carbon content effect coating hardness and wear resistance. Stainless steel alloys are also readily available. All of these products are appropriate for general restoration, salvage and build-up of worn and mis-machined components, with harder alloys providing additional wear resistance. provide a self-lubricating bearing surface and exhibit good resistance to acids and other strong reagents. Ideal suitability includes adjustable bearing shoes in machine tools. produce hard, lubricious surfaces that are resistant to abrasion, galling and scuffing and exhibit a very low coefficient of friction. These characteristics are the result of molybdenum oxide formation on the surface. Key applications for this material are for automotive and other transportation equipment components. The Plasma Spray Process is basically the spraying of molten or heat softened material onto a surface to provide a coating. Material in the form of powder is injected into a very high temperature plasma flame, where it is rapidly heated and accelerated to a high velocity. The hot material impacts on the substrate surface and rapidly cools forming a coating. This plasma spray process carried out correctly is called a “cold process” (relative to the substrate material being coated) as the substrate temperature can be kept low during processing avoiding damage, metallurgical changes and distortion to the substrate material. In flame wire spraying, a typical gas spraying method, wires are consecutively fed into a gas flame, such as oxy-acetylene or oxy-propane, get molten and sprayed using compressed air to form coatings. All kinds of metals that can be made into wires, including zinc, aluminum, carbon steel, stainless steel, and molybdenum, can be applied to this spraying technique. Thickness range is wide, from 0.1 up to 10 micrometers. 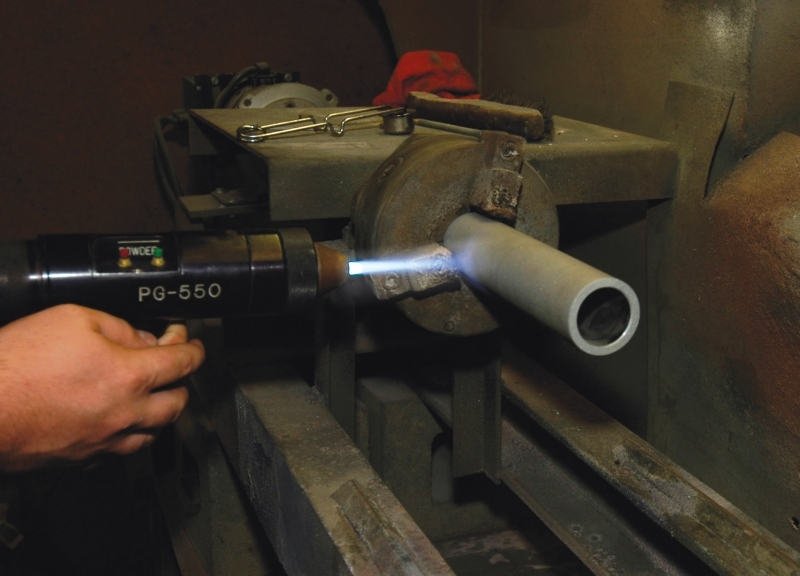 Using the same principle as flame wire spraying, this method requires an oxide ceramic rod as a coating material. The ceramic rod is fed into an oxy-acetylene flame, gets heated and molten, then becomes finely divided by compressed air and solidified on a base metal, forming a coating. Since it uses ceramics, this method is suitable for corrosion-protection spraying or wear-control spraying, which improves heat resistance around hot areas. In this form of spraying, a powder material is fed into a spray gun through a powder pump and gets molten and heated in a high-temperature flame, forming a coating. There are largely three powder feed methods: linking the powder pump directly to the spray gun, using a separate powder pump, and feeding into the spray gun using an inactive gas (e.g., nitrogen). Powder is fed into the sprayed gas and gets heated, molten, and sprayed at high velocity, finally forming a coating. In this typical electric spraying, two metal wires generate electrical arc discharge and get molten and fed in keeping pace with the melting velocity. The melted metals then get finely divided by compressed air and consecutively molded on a base metal, forming a coating. Compared with the flame spraying methods, it shows excellent performance. Since a coating material can be thoroughly molten under high temperature, it provides outstanding adhesion to a base material. However, coating materials are limited to those electrically conductive. The Detonation gun basically consists of a long water cooled barrel with inlet valves for gases and powder. Oxygen and fuel (acetylene most common) is fed into the barrel along with a charge of powder. 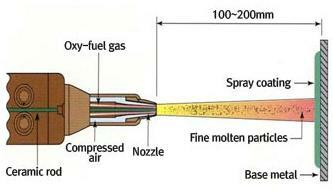 A spark is used to ignite the gas mixture and the resulting detonation heats and accelerates the powder to supersonic velocity down the barrel. A pulse of nitrogen is used to purge the barrel after each detonation. This process is repeated many times a second. The high kinetic energy of the hot powder particles on impact with the substrate result in a build up of a very dense and strong coating.